1965 Ron Export Quality Malibu #4998 9 ft 7"
Foam blank, 3/8" redwood stringer and triple laminate tailblock. Fibreglassed, pigment decor. Two post production leg rope plugs. Black script/text In orange vertical diamond with outline. Note clear box at bottom, possibly for additional decal? Purchased from a Sydney wharehouse, Hoffnungs (in Clarence or Kent Street) by a friend of Mr Anderson for his two sons and their friend in 1966. Mr Anderson's friend had a barber's shop in Belmore, who dealt with Hoffnungs. The barber ordered the boards (chosen unseen, by colours!) and they were picked up from Belmore. 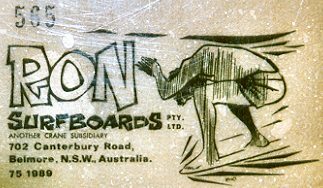 One of a lot of three boards, they came in shipping cartons identifying Ron Surfboards, Export Quality and Product of Australia and cost $99.00. 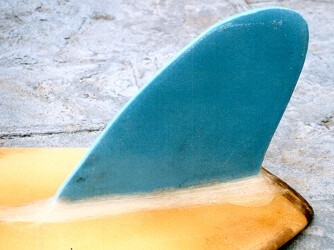 The second board was a similar design, 9ft 6'' with an all orange pigment gel coat. The third board was also 9ft 6'', but a gun template, colour unknown. This board severely delaminated after minimal use, was returned to the supplier and replaced with a 9ft clear board with red deck panels and a standard malibu shape similar to boards 1 and 2. 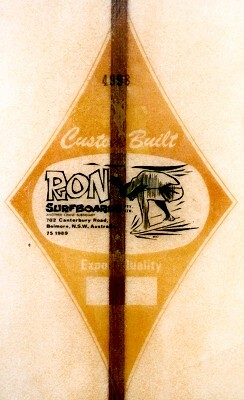 Boards were shipped by Ron Surfboards in the mid-1960's to the USA. These boards were probably forwarded to a wholesaler as excess stock when the company stopped board production circa 1965.. These designs were not current in 1966. Two post production leg rope plugs fitted by Scott Anderson, circa 1980..
#121 Ron narrow nose template, circa 1964.